Last week was another of our Crafty Hangout weeks in which some of your favorite crafty bloggers get together to present 5 days of creative goodness on Google+ hangouts. If you missed any of the #EasterHOA shows live last week, you can still watch the Youtube recordings by heading over to the Crafty Hangouts site. 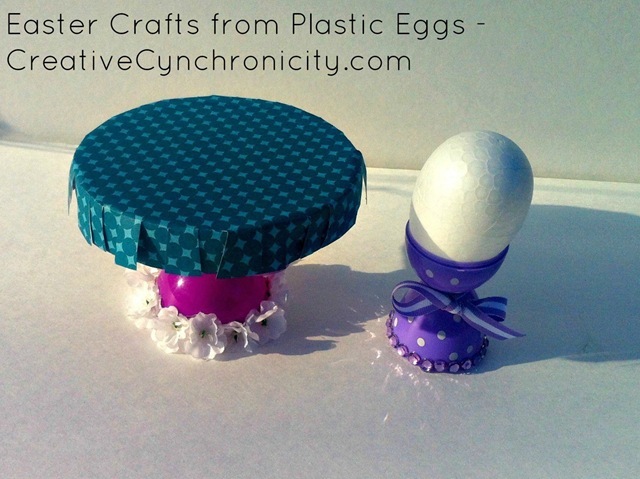 I took part in one hosted by Erin of My Very Educated Mother and made these cute Easter plastic egg crafts: a cupcake (or cookie, candy, or even small basket) stand and an egg cup inspired by Savannah Starr of Cool2Craft. Check out the Youtube video below if you want to see the full tutorial for these plastic egg crafts as well as Erin’s Mexican cascarones. To subscribe to my Youtube channel, click here. That is so creative! Thank you for sharing! This is so creative. What a great idea! Thank you for doing a video tutorial. The “non-crafty” moms like me need all the help and instruction we can get!